The constitution guarantees "the free uise o ither leids spreid amang the population". Heid o state an heid o govrenment, efter the post o prime meenister wis abolished follaein a constitutional referendum. +374 97 for mobile phones. The Nagorno-Karabakh Republic (NKR) (Armenie: Լեռնային Ղարաբաղի Հանրապետություն Lernayin Gharabaghi Hanrapetut’yun), or Artsakh Republic (Armenie: Արցախի Հանրապետություն Arts'akhi Hanrapetut’yun) is a de facto independent republic locatit in the Nagorno-Karabakh region o the Sooth Caucasus. It controls maist o the territory o the umwhile Nagorno-Karabakh Autonomous Oblast an several Azerbaijani districts adjacent tae the borders o Azerbaijan wi Armenie tae the wast an Iran tae the sooth. The predominantly Armenian-populatit region o Nagorno-Karabakh became disputit atween Armenie an Azerbaijan when baith countries gained unthirldom frae the Roushie Empire in 1918. 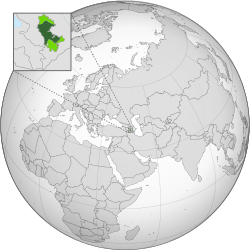 Efter the Soviet Union established control ower the aurie, in 1923 it formed the Nagorno-Karabakh Autonomous Oblast (NKAO) athin the Azerbaijan SSR. In the final years o the Soviet Union, the region re-emerged as a soorce o dispute atween Armenie an Azerbaijan, culminatin in a lairge ethnic conflict an, eventually, in the Nagorno-Karabakh War that wis focht frae 1991 tae 1994. On December 10, 1991, as the Soviet Union wis collapsin, a referendum held in the NKAO an the neighborin Shahumian region resultit in a declaration o unthrildom frae Azerbaijan as the Nagorno-Karabakh Republic. The kintra remains unrecognized bi ony UN-member state, includin Armenie. Anerlie Transnistrie, Sooth Ossetie, an Abkhazie, aw UN non-members recognises the state. Syne the ceasefire in 1994, maist o Nagorno-Karabakh an several regions o Azerbaijan aroond it remain unner the jynt Armenian an Nagorno-Karabakh military control. Representatives o the governments o Armenie an Azerbaijan hae syne been hauldin peace talks mediatit bi the OSCE Minsk Group. ↑ "ԼՂՀ 2015Թ. ՄԱՐԴԱՀԱՄԱՐԻ ՆԱԽՆԱԿԱՆ ՕՊԵՐԱՏԻՎ ՑՈՒՑԱՆԻՇՆԵՐԻ ՄԱՍԻՆ". STAF NKRE. 30 March 2016. Archived frae the oreeginal on 16 April 2016. Retrieved 30 March 2016. ↑ 3.0 3.1 "Constitution of the Nagorno-Karabakh Republic. Chapter 1, article 1.2". Wikimedia Commons haes media relatit tae Republic o Artsakh. This page wis last eeditit on 16 Mairch 2019, at 07:02.